It’s been a while since Crimson Skies was released, back in the days of the old Xbox. Since that time a few games have tried to duplicate its mixture of flying, shooting and multiplayer mayhem, but like KFC’s 13 herbs and spices, nobody has managed to do it. Now EA has decided to give it a try, using their MySims brand to give it a go. Any takers? You play as a character who awoke on a beach near Sky Force headquarters in bad health and in need of rescue. A few of the Sky Force pilots find you and bring you to the base to be resuscitated. Once revived, you discover that you have no memory and are immediately thrown into a plane to determine if you can A.) fly, and B.) survive. You spend the rest of the game trying to regain your memory and stop the evil Morcubus from succeeding in his plan to rule the skies. Something tells me one will be related to the other. 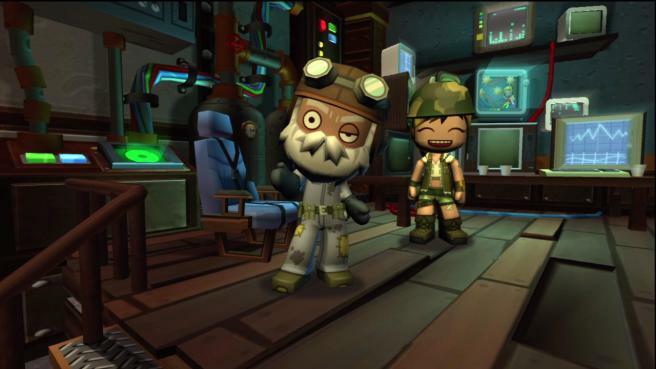 The Sky Heroes are super deformed pilots who fly around in super deformed aircraft. The world in which they fly is colorful and varied, but I would be lying if I told you it was pushing the capabilities of the PS3. Heck, I suspect the PS2 could probably handle the load here. The game isn’t ugly, it’s just the designers went for simplistic and kid friendly, and they got it. Simlish is the product of Satan and must be purged with fire. Who’s with me? Oh, sorry. Ya, within minutes of starting the game I realized I was in for a very annoying time with Sky Heroes. All of the dialogue is in Simlish, with subtitles for those of us who don’t speak it, namely, EVERYONE IN HISTORY. Ya, I’m sorry, but rule number one of game design is don’t annoy your customer, as they will stop being your customer. Were I not reviewing this game, I think I would have stopped seconds into my play through. Not only is Simlish the language of choice, there is no option in the menu to turn off dialogue. Totally unforgivable. Anyway, the rest of the audio isn’t too bad. The music is fairly interesting in a Summer action movie sort of way, and the sound effects are simple but they work. 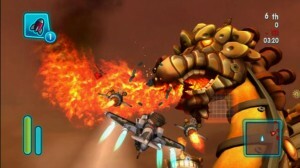 Sky Heroes is at heart a childrens’ game, and as such it’s a very forgiving game. There is no stalling your airplane, no way you can die by crashing into things like the ground or buildings, and the controls are fairly simple, intended for those not yet capable of grasping concepts like roll and yaw. 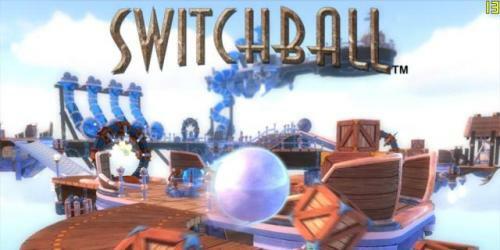 You have three main types of gameplay in the single player. There are team dogfights, melee dogfights and then there is the race component. In each mode the objective is to finish within the Top 3 to advance to the next stage. Melee Dogfights require that you survive against a number of opponents, and are generally the easiest. Team Dogfights also have you fighting a number of opponents, but since you can’t shoot down your team mates (for points at least) it’s more difficult to succeed. Making you compete against your teammates to advance the story in single player mode was a bad choice, particularly when they are more than happy to steal your kills. The race component is set up in a manner similar to Mario Kart, or, more accurately, it’s set up like the airborne portion of Diddy Kong Racing. Fly around a track, hit check points which double as turbo “windows”Â to keep pace, and gather power ups to attack those ahead of you or defend against those behind you. The race section should be the most entertaining portion of the game, but instead the game misfires. I believe it’s impossible for someone to take the lead early in a race and hold it against anyone who has more than two synapses firing in their brain. Combine that with a respawn system that places you back on the track at a stand still after being taken out means that a mode which could have been intense and attention grabbing becomes cheap and annoying very quickly. The game moves very quickly, and it can be difficult to see your opponents on the map. Instead of locking onto a single target, the game points you towards all of your opponents on the screen, no matter which one you are currently engaging. That means when they fly past you, you have to take your eyes off the main screen and peek at the radar to try and find them, then back at the main portion of the screen to locate where the game is telling you that opponent is, and back again because by now your opponent has whizzed past you once or twice more, until finally you break off the fight and get far enough away to turn around and engage from a distance. The controls, while basic, do a pretty good job of allowing you to move around in a dogfight. You are given a throttle control, a button to allow you to perform hard turns, and you can perform special maneuvers by flicking the right analogue stick. The shoulder buttons are how you control your primary and secondary weapons. You can replay any of the single player campaign missions over again, if you like. In fact you may have to, as placing first in the missions often unlocks entire planes, while placing second or third may only unlock portions of planes. Of course you can also build your own plane from the various parts at your disposal, so it’s not really a huge concern unless you’re going for trophies. There is an online portion to the game. I suspected it was actually a myth at one point, but I did succeed in playing against an individual after waiting for an hour in the lobby. I’ve actually written the entirety of this review while waiting in another lobby to play another round, that person having fled my elite skills. 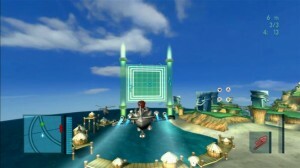 The game also comes with the option to play two player split screen. This is actually pretty good. You can race and dogfight against a friend and AI opponents, or just against your friend, in battles that are timed or set to end when a certain score is reached. As you advance in the story you unlock newer and better equipment, making your plane faster and stronger. The opponents don’t really get any more difficult, but the stages start to get cluttered with more and more buildings and such which your opponents can hide behind to avoid missile fire and the like. Towards the end you do fight a couple of battles which are more difficult, but as they could be viewed as boss battles that’s not really surprising. The racing portion of the game is actually more unbalanced than the dogfighting, as your plane will often just not be strong enough or fast enough to repel enemy attacks from behind or to catch them without taking them down. Also, while you start from a standstill when you are shot down or crash, your AI opponents do not, making it that much more frustrating, as they spawn practically next to you. Well, the story is predictable and the game is a watered down mixture of Diddy Kong Racing and Crimson Skies. I’m not sure there is very much that is original here. Perhaps the use of super deformed characters and planes, and the ability to create your own plane from any parts you happen to have. There is nothing here to keep my attention, but a child might be more forgiving. But even then, the game is probably too fast for a kid to play comfortably. While sitting waiting for my chance at playing the game online, I wondered if there was simply nobody out there who wanted to play it, or if the people who would want to play it simply weren’t old enough to be allowed to play online. The game is meant for younger players, but I don’t know if younger players are going to want to play it. In addition to creating your own planes, you are also able to create your own character, how he or she looks, what they wear, etc. 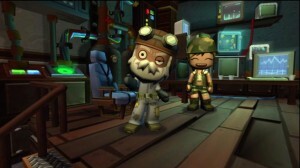 These characters can also be used in the multiplayer, but it gets better. Not only do you get to use all of the characters you unlock, some of those characters are from different EA games, like Morrigan and Commander Shepard from the BioWare side of EA, or those two guys from the Army of Two series. Oh and Issac from Dead Space. All in super deformed cuteness. Disturbing, really. 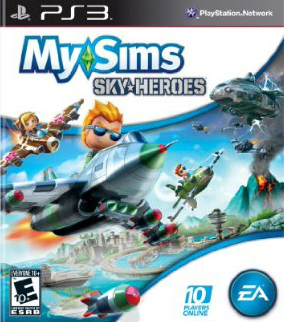 MySims: Sky Heroes is a game that misses its target. It’s aimed at children, but probably a little too difficult for the kind of kid who would be interested in playing such a game, and too annoying for those who are old enough to understand what’s going on.